Get ready to tuck in! Exciting things are afoot on the blog; it is being redesigned *as we speak* which means that pretty soon I will be unveiling the new look for Spring/Summer 2015 on The One-Handed Cook website. Woo hoo. In other news, Black Friday and Cyber Monday have been and gone, which means that Christmas is practically upon us. I’ve made a list, I’m checking it twice, and yes, I still need to buy about 800 presents. I have started an Excel spreadsheet to keep track of all the gifts, which feels a bit too organised, even for me. What else is new? Well, my son is obsessed with Match Attax trading cards, my daughter with her Tiny Tears doll and my husband with his new KitchenAid, which he was given for his birthday. A beautiful red KitchenAid just for me him. In the meantime, here’s something for you: a soup recipe to help chase away the November blues. It’s a recipe my grandma – a wonderful home cook – used to make, and my mum has passed it on to me. Like all my soup recipes, it’s dead easy to make, and completely delicious. 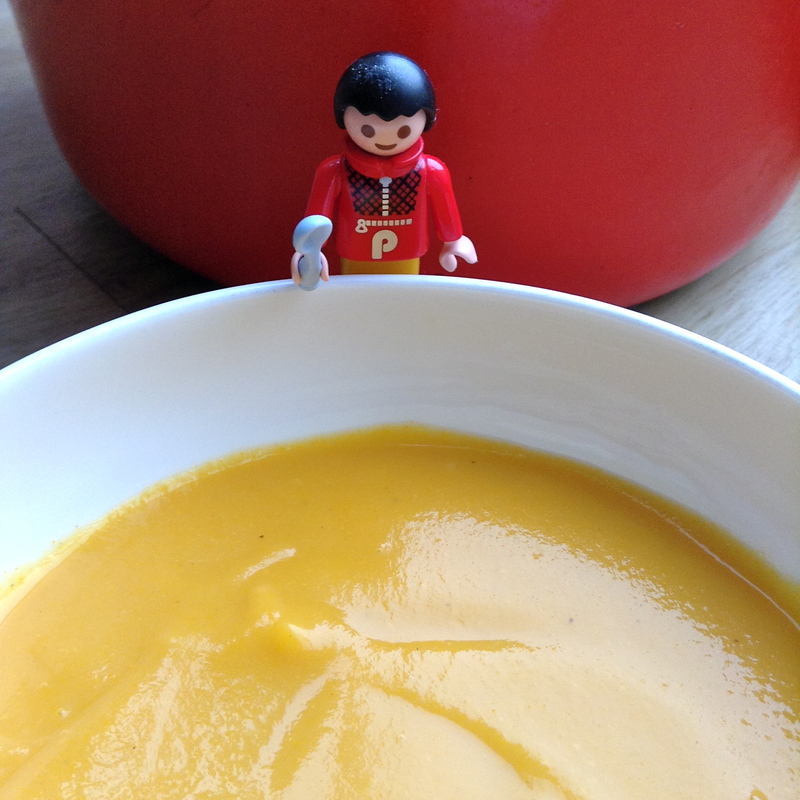 You can make it in stages – make the soup and liquidise it later, if needs be. It also freezes really well, so make double if you have the energy – and freeze half for later. Steaming hot, silky smooth, deliciously fragrant Carrot and Tarragon Soup on a cold winter’s day; what could be nicer? A delicious soup for the whole family. Omit the salt – and go easy on the pepper – if serving to babies and toddlers. If serving to grown-ups, the soup looks good served with a swirl of cream and a bit of chopped parsley on top. It will keep in the fridge for several days and freezes well in an air-tight container. Heat the oil in a large, heavy-bottomed saucepan (I use a Le Creuset), add the onions and cook gently for a few minutes. Add the carrots, stir well with the onions and continue cooking for a further 5 minutes or so. Add the stock, the potatoes and the tarragon. Bring to the boil and simmer gently for 20-30 mins. Check that the carrots are cooked. Season to taste. Reheat the quantity you need and pour into bowls. I recently had a great session on food styling for blog photography with a food stylist. 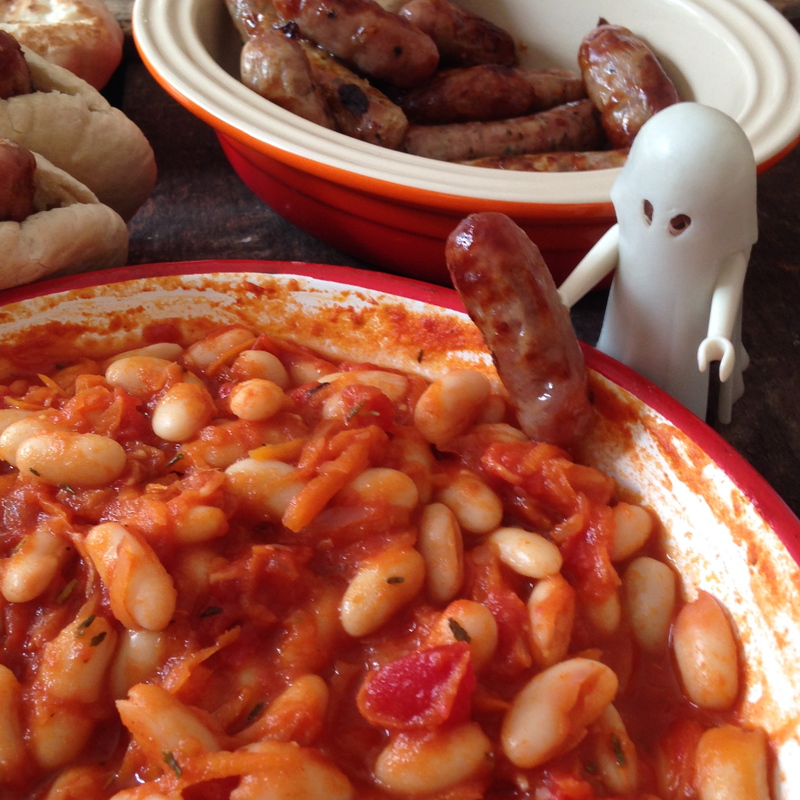 We had a great session making these Smoky Baked Beans and Bangers, and I really enjoyed using my Playmobil ghosts to make them feel a bit autumnal and spooky. This would be a nice dish for a Bonfire Night gathering. 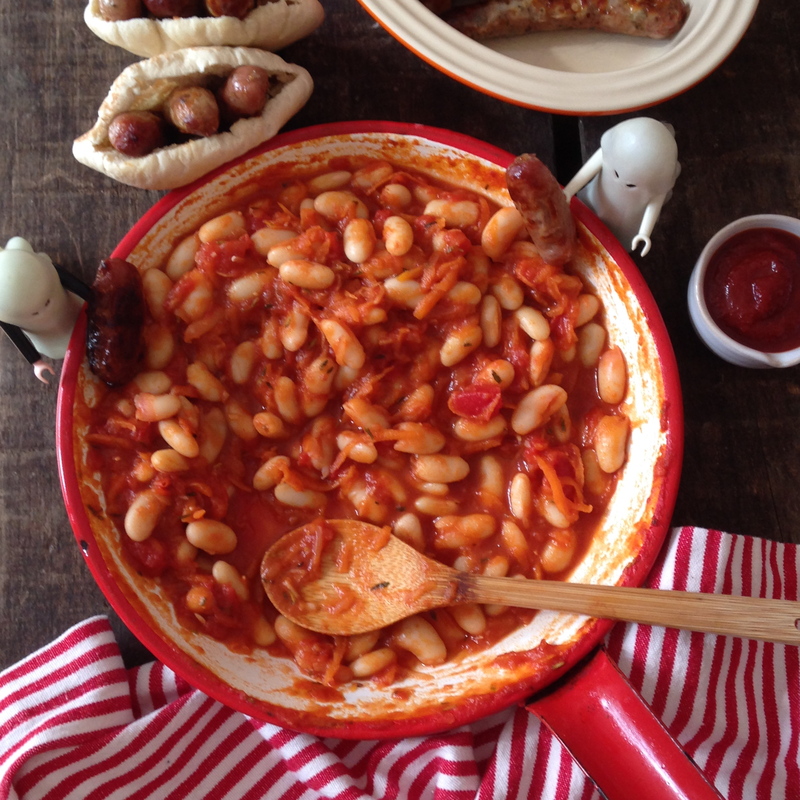 I love the dish styled in the gorgeous red enamel saucepan. This was picked up in a charity shop! I have to confess, much as I love a browse in a secondhand store, kitchenware is not something I would have thought of looking for, so that inspired me straight away. This is an easy dish to make and perfect for autumnal evenings now the nights are drawing in. Healthy cannellini beans are full of fibre and the dish contains no added sugar, unlike tinned baked beans. Grating the onion, carrot and garlic is a ‘grate’ (sorry) quick tip and means less chopping, obvs. Cooked mini sausages, and mini pitta breads to serve with the beans. Heat the oil in a large non-stick frying pan. Add the onion and carrot and cook for 3 minutes until starting to soften. Add the garlic, herbs and paprika and continue to cook for a couple of minutes. Add the tomatoes and beans, bring to the boil and let them bubble for 5 minutes or until thickened. Season with salt and pepper before serving with mini sausage pittas. Happy Bonfire Night, and be safe. Life has been far from perfect of late, purely in terms of how busy I am, husband is, and indeed we all are. What with a work trip, the new term and associated school admin, sorting out jobs that need doing to the house, piles of washing, getting up really early in an attempt to Get Things Done, oh, and having a cold for three weeks, sometimes it all feels a Bit Much. But busy isn’t always bad, and I’ve managed to fit in some fun stuff, too, including a lovely session with an amazing food stylist I met through work who has given me some fantastic tips for the blog (more on that soon), plus it’s Mumsnet Blogfest next month, which I am sure will be pretty perfect. It’s a great chance to get inspired about various aspects of blogging (although I am not sure I will ever ‘change the world’ with a pasta recipe, but hey ho), swap blogging stories, have a laugh, drink some sparkling wine and get a nice goody bag. What’s not to like? I am looking forward to hearing one of my fave authors, Rachel Joyce, speak, learning how to make my blog better and, best of all, meeting fellow bloggers old and new. Whoop. 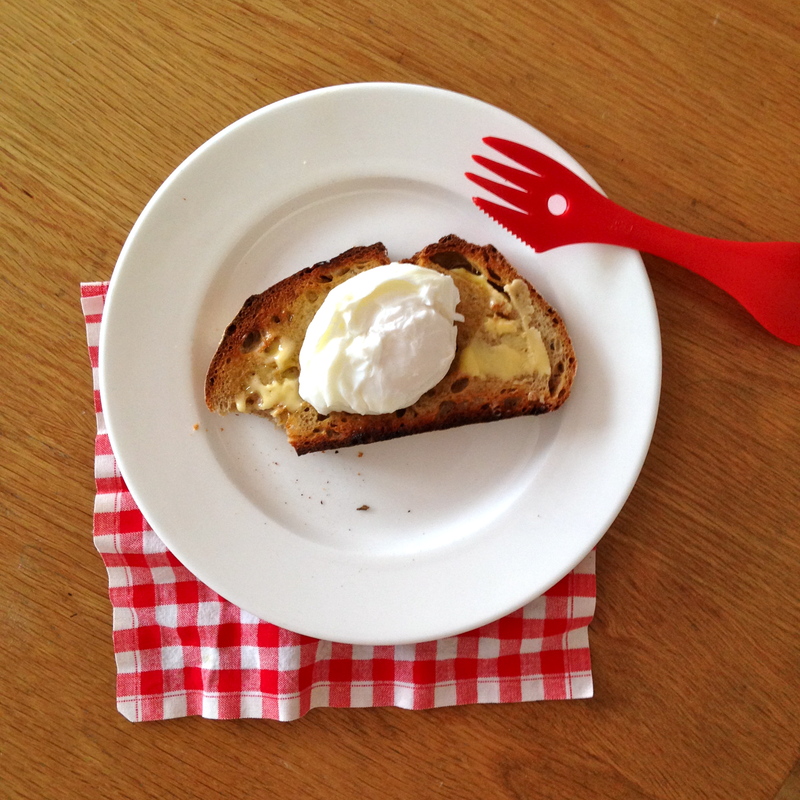 In the meantime, I have learnt how to make the *perfect* poached egg. (I know!) Eggs are wonderfully comforting, and a simple soft poached egg served with a slice of buttered toast and a mug of tea can do a lot for a busy, frazzled parent in need of some TLC. Preparing something so simple and nourishing, in (hopefully) a moment of calm while baby naps or the children are at school, or simply for breakfast, can be a very pleasant interlude. And as for that satisfying moment when the yolk spills out on to the toast, well, it can be quite therapeutic, particularly if it is soft, runny and cooked to perfection. Free-range eggs are also a great nutritious dish for the whole family (babies should be over 1 if you are serving the yolk soft) – they’re packed with protein and B vitamins, they’re easy to prepare and cook and frankly, the perfect dish for a quick, healthy energy boost – perfect for anyone on the go. What’s more, if you can crack an egg one-handed, poached eggs and toast can easily be prepared with one hand while a) holding baby, b) filling in yet another form/cheque/reading book record for school, or c) typing an email on your phone to your boss with the other. If you have a Spork, you can even eat it one-handed too. Perfect. The trick with the vinegar I learnt from my food stylist friend Rosie. It works a treat! Bring some water to the boil in a small saucepan (fill it about two thirds full). Take a teacup and pour in a centimetre or so of white wine vinegar, swill it round, then return the vinegar to the bottle. Crack the egg into the teacup. Once your water is boiling, create a whirlpool in the water by stirring it with a small wooden spoon. Add the egg to the centre of the whirlpool, reduce the heat slightly and cook for 2 ½ minutes for a soft yolk. Once cooked, remove the egg using a slotted spoon and put on a plate. Use a teaspoon to remove any of the ‘frothy’ white (it comes away easily) to ensure your poached egg has a nice regular shape. Place the egg on top of your toast and season with salt and freshly ground black pepper. Last week while visiting the in-laws in Somerset I was given 2kg of plums by one of their neighbours who had so many Victoria plums she didn’t know what to do with them all. We’re talking plum city! So anyway, bringing a huge box of plums back to London did rather focus the mind, and so I decided to make jam for the first time (more on that later…) and also to whip up some lovely plum muffins. I figured the slightly sourish plums would combine beautifully with white chocolate and make for a seriously gorgeous muffin – which they do. I think this is the fourth muffin recipe to appear on the blog, and quite possibly the best! The whole family loved them. So once you’ve made them, pour yourself a coffee and enjoy – with or without the kids. Melt the butter (in a bowl over a pan of simmering water) and set it to the side to cool while you mix together all your dry ingredients in a largeish mixing bowl with a wooden spoon – flour, sugar, bicarb, salt, baking powder. In a separate bowl mix your wet ingredients – the yogurt, eggs and vanilla essence – then add the cooled melted butter and stir. Pour the wet ingredients into the dry ingredients and mix together, but don’t overmix. Fold in the plums, white chocolate chunks and lemon zest. If it’s feeling a bit dry, add a dash of milk. 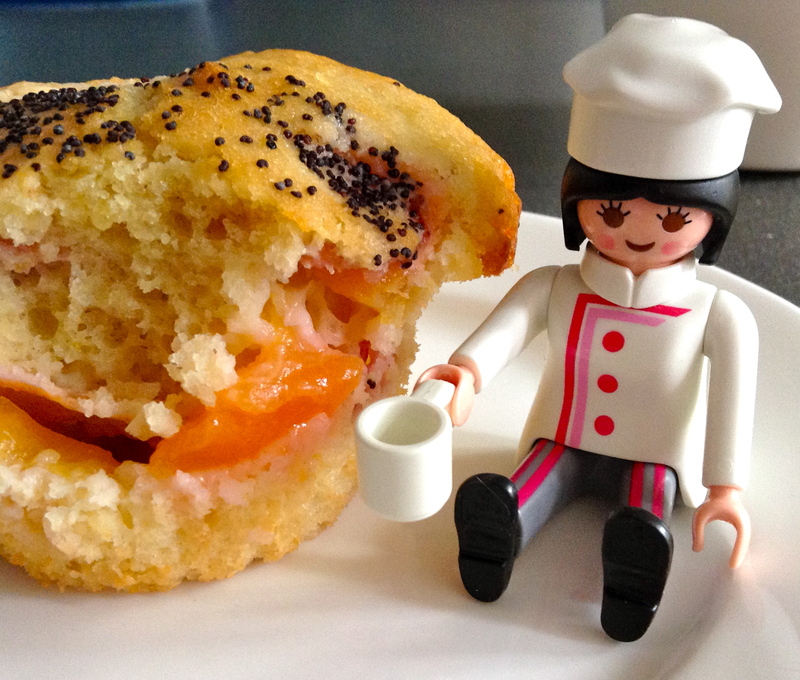 Spoon the mixture into the muffin cases, filling each hole about two-thirds full, and sprinkle poppy seeds on top. Bake in the preheated oven for approx. 20 mins – test with a skewer – and cool on a wire rack. These will keep for a couple of days in an airtight box. They also freeze well.